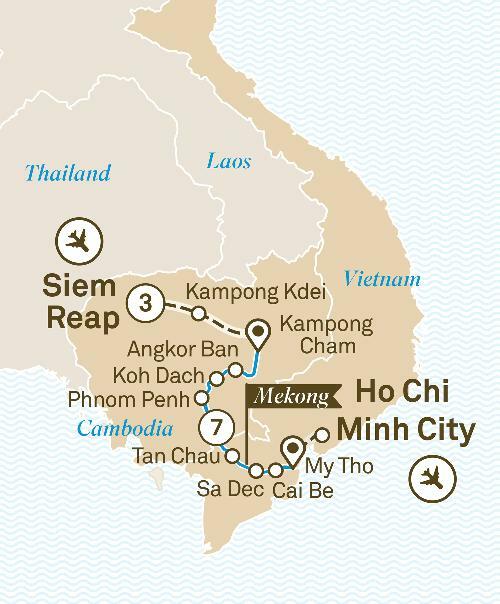 Embark on a luxury journey from Siem Reap to Ho Chi Minh City discovering the culture and history of Cambodia & Vietnam and the majestic Mekong River. The fascinating Mekong is many things to many people. Embark on a journey of contrasts as you gain a deeper understanding of Cambodia and Vietnam’s complex histories and be charmed by the friendly locals as they go about their daily lives along this magnificent waterway. Marvel at the sunrise over the majestic Angkor Wat, receive a monk’s blessing and appreciate the spectacle that is Phare, the Cambodian Circus. Explore the ancient hilltop monastery of Wat Hanchey and immerse yourself in the beauty of Khmer handicrafts in Cheung Kok. Sometimes simply sitting back and watching the world glide by is the perfect way to relish the sights and sounds – especially when ensconced in luxury on board the boutique Scenic Spirit. Let the Mekong captivate and astound.